That this Colony has hitherto been governed by paid Officials, upon the false assumption that law is greater than justice because, forsooth, it was made by them and their friends, and admirably suits their selfish ends and narrow minded views. It is the object of the “League” to place the power in the hands of responsible representatives of the people to frame wholesome laws and carry on an honest Government. under the assumed authority of the Royal Prerogative the Reform League will endeavour to supersede such Royal Prerogative by asserting that of the People which is the most Royal of all Prerogatives, as the people are the only legitimate source of all political power. Immediate objects of the Reform League An immediate change in the management of the Gold Fields, by disbanding the Commissioners. The total abolition of the Diggers’ and Storekeepers licence tax, and a thorough and organised agitation of the Gold Fields and the Towns. That to carry out the forgoing objects there should be a large tent erected in which to meet and conduct the business of the Reform League. Cards of membership will be issued in a few days and Ballarat divided into districts. of Committees, for their unwarrantable assertions respecting the veracity of the Diggers and the respectability of the representatives of the public press on the gold fields, and their sneering contempt at an appeal for an investigation into the malpractices of the corrupt Camp at Ballarat. That this meeting having heard read the draft Prospectus of the Ballarat Reform League approve of and adopt the same, and hereby pledge themselves to support the Committee in carrying out its principles and attaining its objects – which are the full political rights of the people. That this meeting expresses its utter want of confidence in the political honesty of the Government Officials in the Legislative Council, and pledge themselves to use every constitutional means to have them removed from the office they disgrace. That this meeting also expresses its disapprobation of the mode in which the Board of Enquiry was appointed. That it ought to have been composed of independent gentlemen and not paid officials. 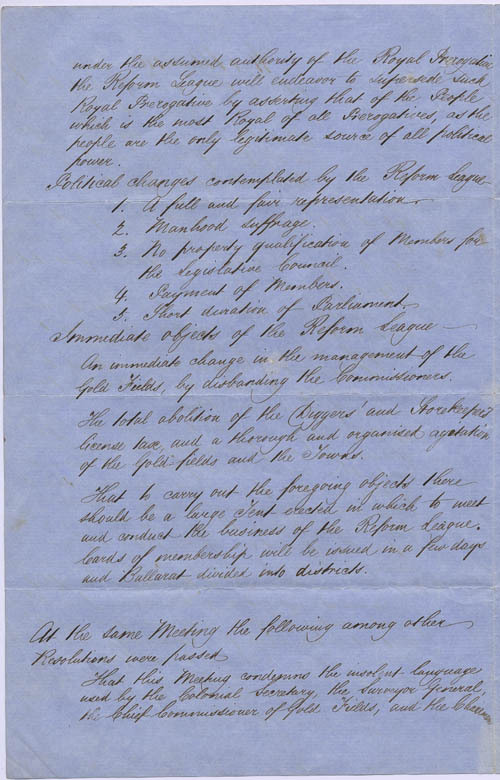 27 Nov. 1854 Resolutions passed at a Public Meeting on Bakery Hill Ballarat. 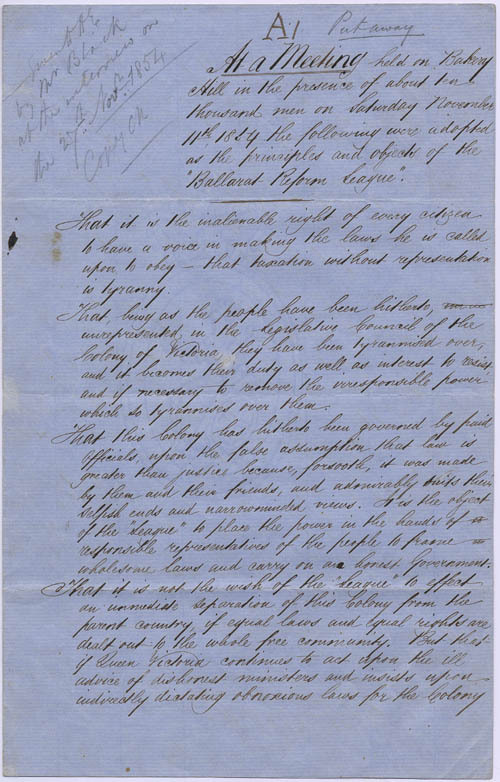 The Ballarat Reform League Charter is a four-page handwritten manifesto of democratic principles and demands, presented to Governor Hotham in November 1854, a few weeks before the Eureka Stockade rebellion. 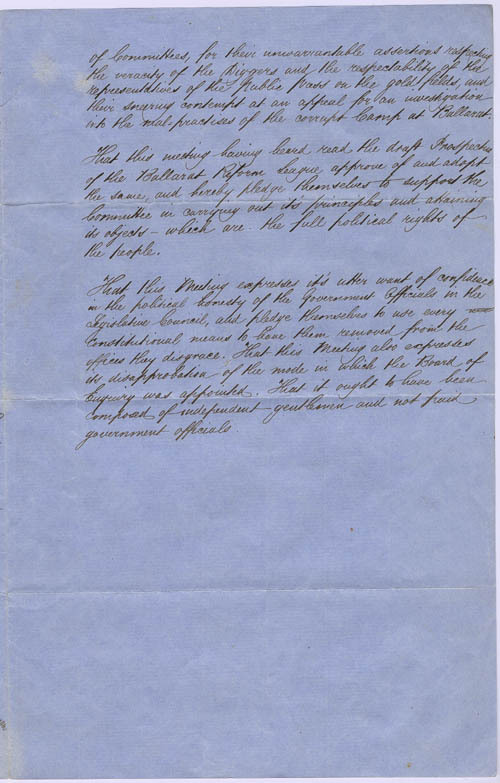 The Charter is handwritten on watermarked government blue paper, folded into four foolscap-sized pages containing the text of the charter adopted by over 10,000 miners and storekeepers on Bakery Hill on the Ballarat goldfields on 11 November 1854, establishing its authority to represent the opinion of the majority of the adult population of Ballarat. The Southern Cross flag, designed and adopted by the Ballarat Reform League, was flown for the first time at this meeting. 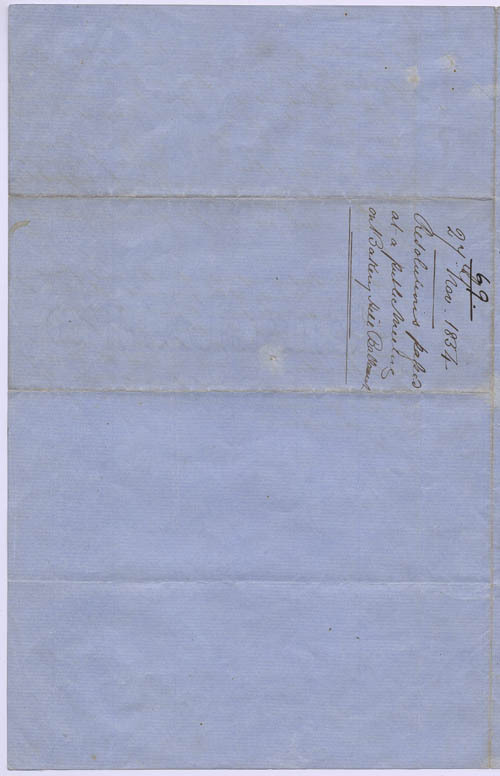 The Charter was presented to Governor Charles Hotham on 27 November by representatives of this meeting, who also demanded the release of three prisoners arrested for burning James Bentley's Eureka Hotel. This is a clerk's copy of the original Charter, held by the Public Records Office, Victoria. The original has not survived, and its format is unknown. The copy was created for administrative purposes by the Governor's office at the time it was received by Governor Hotham. It has markings on it indicating it was created by the Governor's office and that it was the copy read by Governor Hotham. The Charter expresses universal democratic values, drawn from Chartist and other international democratic movements of its time. It asserted that the people are the only legitimate source of political power and demanded the abolition of the hated licence system, manhood suffrage, payment of members of parliament and no property qualification. It is believed that J.B. Humffray penned the Charter of Rights. The Ballarat Reform League Charter was presented at a meeting on 11 November 1854 and ratified by a crowd of about 10,000. The Ballarat Reform League Charter is the first document in the history of Australia to promote participatory democracy. That document has been entered into the UNESCO Memory of the World database, which aims to collect the most important documents in the history of mankind. Ballarat Reform League Charter is historically significant in the history of democracy in Victoria and as a central feature of the Eureka story, one of the most significant and influential events in Australia's political and social history. The Charter is also of historical significance as an expression of the Ballarat Reform League as a political movement and a forerunner of organised labour in Australia. The Ballarat Reform League Charter is socially significant as it is widely seen as having ongoing relevance to the Australian people and their democratic institutions. The struggle for democratic reform, as expressed in the Charter and the Eureka rebellion, is of fundamental significance to our understanding of Australian society and democratic institutions. ↑ http://vhd.heritagecouncil.vic.gov.au/places/13970/download-report, accessed 09 June 2017. This page was last edited on 9 June 2017, at 09:42.